Victoria Gray will teach a series of world-dance workshops Tuesday, Aug. 12, through Aug. 20 in Fremont. at Visionary Dance Productions (VDP), 4128 Fremont Ave. N. Students may sign up for the entire week of workshops or for individual days. Gray, the artistic director for Silk Road Dance Company, has been dancing since childhood and teaching for more than 30 years. Gray started out dancing ballet and tap in her hometown of Spokane. ''They also offered flamenco to the older children, so I watched these other classes in fascination,'' Gray said. Gray continued ballet in high school and became drawn to the music, movements and costumes interested in international folk dancing. Gray later enrolled in modern dance classes at Occidental College in Los Angeles, where she helped found the Occidental College Folk and Historical Dance Troupe. extensively, visiting Uzbekistan 10 times. People began asking her for lessons in 1975, so she started to teach informally. ''When I decided to create my own dance company, I had to teach in order to train members in these usual dance traditions,'' she said. 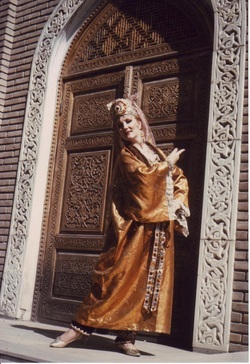 Gray's professional ensemble, the Silk Road Dance Company, frequently performs for dignitaries, politicians and even royalty, including Farah Pahlavi, wife of the former Shah of Iran; Her Royal Highness Princess Haya bint Al-Hussein of Jordan, daughter of the late King Hussein; and Uzbekistan President Islom Karimov. Gray said she is still discovering new genres. Most recently, her dance company has been working with a dance specialist for Crimean Tatar and North Caucasus dance. Besides teaching, Gray has a busy agenda while in Seattle, where she lived for 18 years. High on her list are walking around Green Lake and strolling through the University District. She also plans a pilgrimage to Display & Costume Supply in Northgate to shop for hat forms for new costuming projects for Silk Road Dance Company. For more information about Laurel Victoria Gray's dance classes, call VDP Studio, at 632-2353.